Very recently, we started sponsoring product to Richard Lawrie, who has qualified to take part in the Kona Ironman in Hawaii which will be in October this year. We are in such awe of this amazing young man. The road to Kona (and incidentally his catch phrase) is not an easy one. Just that he qualified is an achievement all on its own. The path to taking part in an Ironman is more grueling than the actual race day. Whether you plan to use up all your allotted hours on the actual day, which is 17, or you are going for your personal best, the training involved is both tough and soul destroying. The three disciplines, if you weren’t aware, are swimming, cycling, and running, in that order. The distances to cover are a 3,86km swim, 180,25km cycle, and a 42,2km run. And, they take place directly after one another, with no breaks, unless you would consider the transition zones break time. But, for most, that is where you refuel, change your outfits (or at most, your shoes), and prepare yourself mentally for the next stretch. The amazing thing about Ironman is that anyone can do it. You may scoff at this statement, but having taken part and finished two Ironman’s in my life, I can very safely say that, with the right mindset, anyone can make this a reality. Sure, there is the issue of the expense of the wetsuit, the bike, the running shoes, the entry, and the bits and pieces that make your life a little easier, but if you really wanted to, these physical items can be obtained easily. Some have pursued the dream with a tenacious heart and a determined mind, even going as far as sourcing sponsorship. And, as the Ironman event takes place across many countries, and is televised across the world, companies are very willing to get involved. You may not be the most adept swimmer. You may not be the strongest cyclist. You may not be the fastest runner. But, just because you are taking part, and have put the effort in to train for such a demanding race, makes you a worthwhile cause to sponsor. 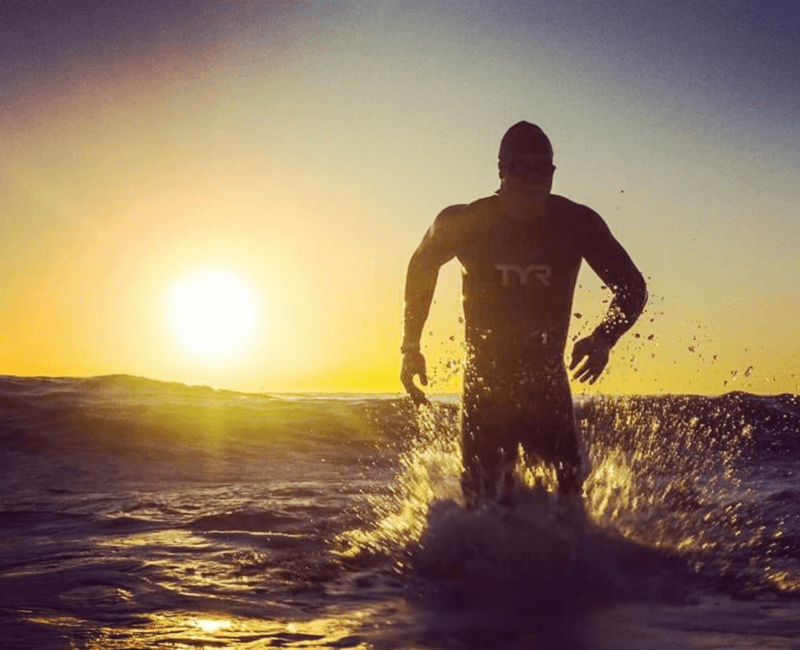 Richard, if you follow his journey on Facebook and Instagram, has shown us that many, many hours are needed in order to take part in, what some would call the Mother of all Ironman’s, the Kona Ironman race. The setting couldn’t be more perfect. Hawaii! But, don’t let the pristine beaches, the bluer than blue sky, and the Aloha greetings make you think you are there for a summer holiday. The route of the Kona Ironman is not one to be sniffed at. The crystal blue hue of the waters can be somewhat deceptive, as some have used the analogy of being slapped, kicked and punched, after swimming the distance for Ironman. The cycle, besides having to traverse the hills, is made even more difficult with 45 miles per hour cross and head winds. And, just to put the cherry on the cake, with your legs feeling like lead, you must complete a full marathon, in the blistering heat of the Hawaii sun. Well, we have painted a dismal picture for you, but ask everyone of those athletes that took part if they would do it all again, and everyone of them will give a resounding yes. The adrenalin, the exhilaration, and the pure god-like power one feels after running over that finish line, is enough to make you press repeat. We wish Richard well on his road to Kona and will be following him every strenuous, but rewarding step of the way. Oh, and you can be sure that Richard will be washing his kit regularly, including his wetsuit, in our magic FungiSolve Solution, keeping it fresh and fungus-free, and giving his tired feet a daily treat with our FungiSolve Foot Repair Cream. Richard can be followed on @richroadtokona on Facebook, and rich_road_to_kona on Instagram.